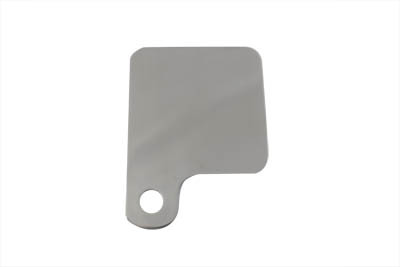 V-Twin Manufacturing - Inspection tag holder has a stainless steel finish with rounded corners on all sides and edges. Tag holder is strong , light weight and looks great. This item is sold-out and is no longer available. A similar or replacement item may be listed below. Inspection tag holder has a stainless steel finish with rounded corners on all sides and edges. Tag holder is strong , light weight and looks great. Picture may not be an actual representation of item. Plate area measures 3" X 4-1/4" with 1/2" mount hole. Can be mounted to footpeg or shock studs. Fits nicely behind left or right passenger footpeg.